When planning a career fair, the biggest obstacle can be optimizing the use of your event space. Managing human traffic flow and maintaining each company’s privacy while also giving everyone the maximum amount of recruiting space can seem nearly impossible, especially when using an open event space such as a gymnasium or ballroom . 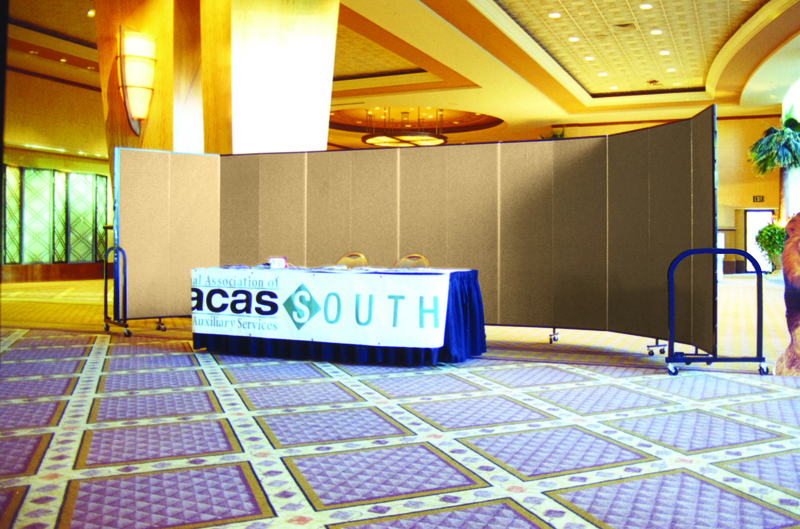 Using portable room dividers is a cost-effective and reusable solution that can transform your career fair into an elegant and professional event. At the main entrance of your career fair, you can set up a divider parallel to your check-in table. Since dividers are tack-able, you can hang directive signs letting students know where to check-in, maybe by last name or major, without damaging any of the walls of your event space. The divider to also blocks the view of the full event from incoming young professionals, making them less stressed and overwhelmed when coming into the career fair. 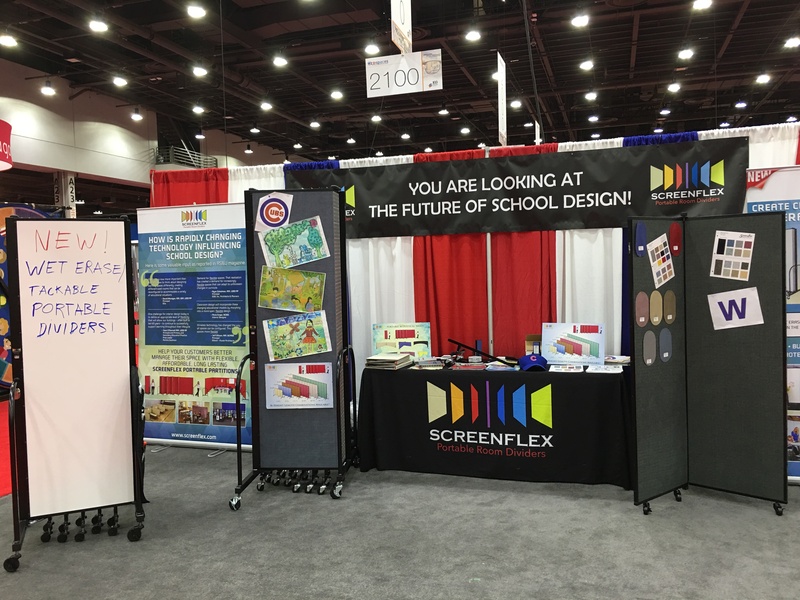 The front divider can also be used to manage attendee traffic flow by having students enter the career fair from alternating sides of the divider. Students will then be circling the corporate booths both clockwise and counter-clockwise, managing the lines that can build up at certain company stations. Dividers can also be a great way to cater to each attending company’s unique needs. For example, a larger firm with 4-5 recruiters searching for 20+ intern class may need a considerably larger space than a middle market company looking to hire just a few new employees. Since room dividers are bendable into curves and corners, among other shapes, you can create a custom sized space for each company. Displaying recruiting materials becomes as simple as tacking a push-pin and cleanup becomes a breeze. The specially designed sound-absorbing quality of portable partitions also manages overall event volume while giving each company’s recruiters a new-found level of privacy. After the career fair is over dividers can be easily stored by being folded compactly accordion style and locked into place. For even more compact storage, dividers can be nested together and fit snuggly into the corner of a tight storage space. 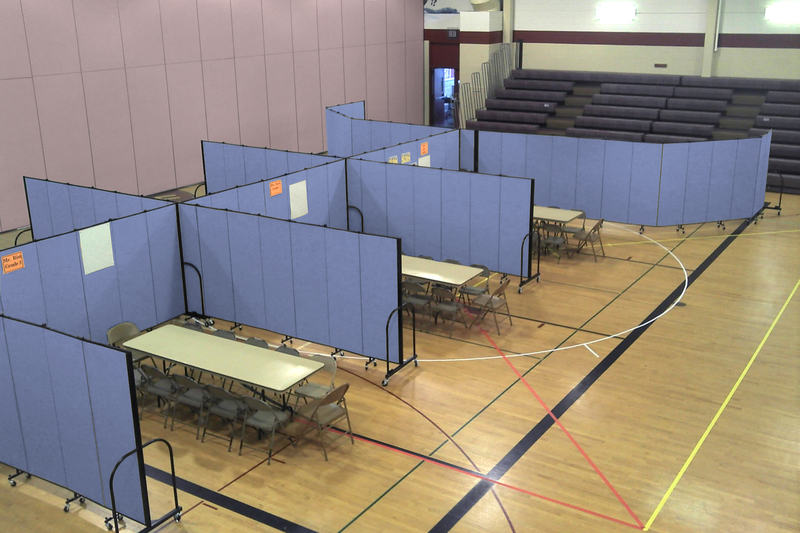 If you career fair is in a shared space dividers are the perfect solution for fast and easy event turnover. Offered in a wide variety of colors and textures room dividers are the perfect way to make your next career fair the pinnacle of school pride and professionalism. Watch how easy it is to use Screenflex Room Dividers to transform your room into an organized event space.